Every action flew down the tangled net of links, reverberating and amplifying itself and disappearing only to reappear again. . . . There was no escaping the reactions to your actions, and no respite from the responsibility. That’s how it happened. That was life. Everything and everybody is connected, somehow, somewhere: this is the structuring principle of Vikram Chandra’s Sacred Games. In that respect, at least, this door-stopper of a novel deserves its inevitable comparison to Dickens, as its multitude of plots and characters crisscross and converge in a manner reminiscent of Bleak House. It’s also Dickensian in its tendency towards self-indulgence: there are long stretches that seemed to me to have no real necessity or justification except the author’s own pleasure in including as many details as possible. And it covers Dickensian extremes of horror and tenderness, and juxtapositions of farce and tragedy. And yet — Sacred Games didn’t move, engross, or delight me in anything like the way Dickens’s novels do, and for all that there were parts that I did really appreciate, by the end there were longer stretches that just bored me. My like/dislike line runs pretty much along the Sartaj Singh / Ganesh Gaitonde divide: I would happily read another whole novel about Sartaj, but I had had more than enough of Gaitonde by the time he finally shot himself in the head — which is not a spoiler, by the way, as it happens very early in the novel, which then takes us back through the tortuous story of how he ended up where we first meet him, in a concrete bunker in a vacant lot on the outskirts of Bombay. Navrati nights are good for pickpockets, certainly. Chain-snatchers and that lot. And a lot of cash gets handled, you know. At five hundred rupees per ticket in some places, that’s a huge amount. People get tempted, the people who are handling the money. We are all already lost to each other, he thought. In the moment of our possession we lose those we love, to mortality, to time, to history, to themselves. What we have are these fragments of generosity, these gifts of faith and friendship and desire that we can give to each other. Whatever comes later, nothing can betray this lying in the dark, this breathing together. This is enough. We are here, and we will stay here. By the end of the novel, we can’t help but feel the fragility of this hopeful contentment, but the chaotic ugliness of so much of the novel also makes it seem just that much more precious. The part of the novel that focuses on Gaitonde, on the other hand, seemed to me to take us into a tediously artificial world — that it’s based on Chandra’s first-hand research, including meetings with real-life gangsters including “Hussain the Razor,” doesn’t help me get past its glossy amorality. The contrast between the two parts — each about a journey but one heading towards quiet fulfillment while the other collapses into solipsistic disaster — is obviously deliberate, but once he’s reached the pinnacle of power and wealth Gaitonde becomes as tedious as Shakespeare’s Richard III does at the height of his success, but without the poetry to make the downward spiral worth following to the bitter end. Gaitonde’s flat affect may be meant to convey his distance, his difference, but that doesn’t make it any less flat. My favorite part of the novel was one of its several “inset” parts, the one called “A House in a Distant City.” This tells the story of Sartaj’s mother Prabhjot, who is something of a mystery to her son: he sees that “she was not telling him everything, there were things she wouldn’t speak of.” We know of these things from this set piece, which tells with powerful understatement of her family’s flight during Partition from their home in what became part of Pakistan. When Prabhjot visits the Golden Temple at Amritsar with Sartaj near the end of the novel, she sits “closed off in some private world of memory and grief and prayer.” Those memories, that grief, is surely for her sister Navneet, “beloved and best of all, and now lost forever.” Prabhjot learned to carry on: “Carry it all, the small dissatisfactions of every day and the huge murderous tragedies of long ago.” For me Sacred Games was at its best when it left the melodramatic world of international crime, terrorism, and film stars and focused on this kind of modest but intensely moving everyday heroism. 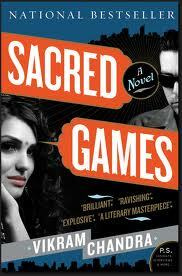 I liked the Sartaj Singh bits and the back-story of his mother. The rest was rather predictable, and as we like to say in India, filmi (too movie-like). Glad to hear my response wasn’t just idiosyncratic, Ava! I tried hard not to compare Sacred Games to A Suitable Boy (which I loved) — after all, just because they are both long books about India doesn’t mean they demand to be considered together. But I did keep thinking about why Seth’s novel won me over in a way that Chandra’s didn’t, and I think it is because A Suitable Boy (for all that it is rich in history and politics) never loses sight of that human intimacy that makes the best parts of Sacred Games so good too. I had much the same problem with Bleak House. Sometimes, when Dickens splits his narratives in two, I end up enjoying one much more than the other. I’ve seen this book in the shop many times and am always tempted to buy. The size of it though does give me pause. Not a fan of Esther? 🙂 And yet for me, every bit of Bleak House is worth it, or maybe I should say has become worth it with rereadings. Who knows: maybe Sacred Games would reward rereading in a similar way, but I’m not at all tempted to test that hypothesis.